Gold awaits the FOMC meeting tomorrow for a potential breakout as it is still depending on the US Dollar. The greenback has been mixed but tomorrow's event could very well set the tone for both the short-term outcome of the Dollar as well as Gold. Much will now depend on the Fed's dots and median forecast, but anything dovish could suggest a huge reversal for the greenback giving back Gold its allure as a safe haven instrument. The levels that we have been used to for the past couple of months will most probably act as huge support and gold prices could skyrocket from there. 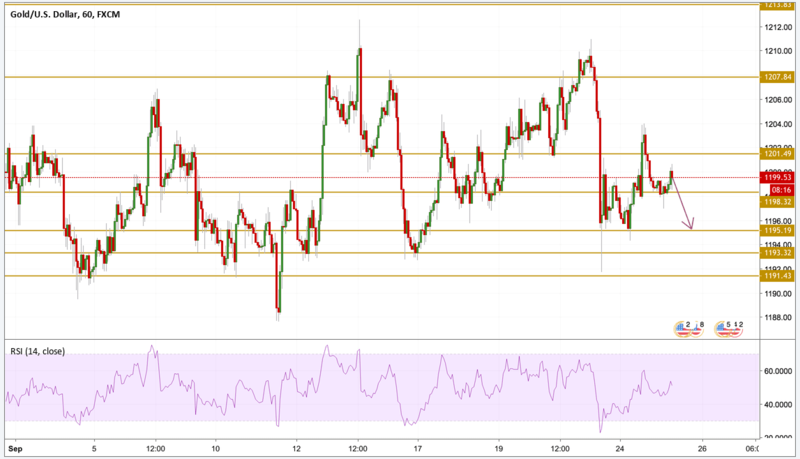 Gold has been consolidating within the familiar sideways channel, meeting a recognizable resistance at $1204 and up from yesterday's support down at $1194. The price is currently hovering just below the $1200 level and we expect it to continue testing the narrow support and resistance levels. The next level we will be focusing on is the $1195.20 support.